I bring the Cocteau Twins’ ‘Cherry Coloured Funk’ off Heaven or Las Vegas, the band’s most beloved album. Liz Fraser’s voice draws, swoops and amazes. In 1990, George Michael was still at the height of his creative powers. He released Listen Without Prejudice Vol. 1 in the September and the following March, its song ‘Cowboys and Angels’ was pressed as a single. It is notable for being the first and only single that did not make the UK’s top 40 chart and the last before everything got complicated. It is quality. The following year, ‘Step On’ was the first single and biggest hit from Happy Mondays’ Pills ‘n’ Thrills and Bellyaches. The song was an evident cover of a track that’s already featured on this blog – John Kongos’ ‘He’s Gonna Step on You Again’ – but the production (Paul Oakenfold and Steve Osborne) and pure chutzpah took some beating. “You know you talk so hip man/You’re twistin’ my melon man.” It brought indie freaks and dance crowds onto the same floor. Before I walk away for Easter, I’ve just read that Malik Taylor has died at the premature age of 45. In 1990, Malik and his crew A Tribe Called Quest released People’s Instinctive Travels And The Paths Of Rhythm, an odd mix of rap, hip hop and jazzy rhymes. It was in the alternative furrow that De La Soul had furrowed the year before with their 3 Feet High And Rising. I recall flipping the vinyl and listening to the start of the B-side: ‘Bonita Applebum’ followed by ‘Can I Kick It?’. Genius. R.I.P. Phife Dawg. Tagged 1990, A Tribe Called Quest, Malik Taylor, Phife Dawg, R.I.P. I’m back. I watched Black Hawk Down last night. Visceral stuff and why wouldn’t Ridley Scott feature ‘Falling To Pieces’ to accompany all those ammunition shells. Originally released on Faith No More’s epic 1989 album The Real Thing, it followed as a single in 1990. Have a great weekend. When I was a lad, the Ozric Tentacles sounded and looked like they had fallen down from a scary outer space and landed in the woods of Wimbledon Common. Someone then handed them a recording contract and in 1990 they released their first major pressing Erpland. I overlook the the album’s spacerock signature ‘Eternal Wheel’ in favour of the reggae-influenced ‘Iscence’. Why? Because there are some vocals; proof of human life. I hate to end the week on a sad note; but I do love to end it with a great tune. 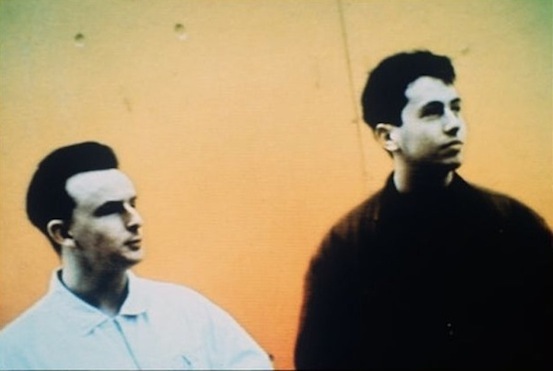 Last month, it was confirmed that Mark Bell, one of the founding members of house duo LFO, has died. With Gez Varley, Bell quickly established himself as one of the pioneers of early UK house music, helping usher in a creative wave of UK techno. They were part of a confident stable of acts from and around Leeds, Bradford and Sheffield that included Forgemasters, Nightmares on Wax and Unique 3. The bands benefitted from the burgeoning club scene in that part of the world as they had a guaranteed audience. In the case of LFO’s eponymous release on Warp Records, the music lived up to the billing. Bleeps and wall-cracking bass. The video was by John Foxx. Have a great weekend. So what happened with these breaks? One episode was taking shape under Easy-E’s stewardship in 1989/90. While at Eazy-E’s Ruthless Records, Above the Law became close allies with gangsta rapsters N.W.A. Their first album Livin’ Like Hustlers featured N.W.A. members and production from Dr. Dre. And this was before Dr. Dre’s seminal The Chronic. Gangsta rap was about to become mainstream, funk breaks were being reborn as G-Funk and it was becoming acceptable for white middle class gents to… well a little biddy tells me that this song might feature at a friend’s 40th birthday bash this weekend. I don’t expect to see any Kings and Raiders caps and gold ropes. Have a great w/e. Tagged 1990, Above The Law, Dr. Dre, N.W.A. You will notice that I don’t have a country music category. I conveniently call Willie Nelson easy listening and would call Uncle Tupelo americana. I think I must have a problem with the stuff in between. But I love the culture the music calls upon. Having marked the world of house music with their proto-trance tracks of the late 1980s, The KLF agreed and put their single hands to kickstarting a trend for the ambient. Their album Chill Out used house music as an echo to an American journey. (The KLF’s Jim Cauty drove around London in a 1968 Ford Galaxie American police car.) The ‘Wichita Lineman…’ also had humour, reminiscent of Malcolm McLaren. Together with Cauty’s work as The Orb, this brew gave birth to “ambient house” and the ubiquitous Enigma project. The Cocteau Twins were Robin Guthrie, Will Heggie and the signature vocals of Elizabeth Fraser. In 1990, they released the charming ‘Iceblink Luck’. As with Lush’s ‘De-Luxe‘, this was a full year before My Bloody Valentine released the shoegazing manual Loveless. Like Lush, the band was already combining distorted guitars with haunting vocals to great effect. Unlike The Twins, Fraser’s vocals were almost intelligible. First up, Pet Shop Boys are a bit of a guilty pleasure. Released in 1990, the retrospective and wistful ‘Being Boring’ is one of the best songs that Neil Tennant ever had the chance to talk through. It was off Behaviour, the duo’s the fifth studio album. They were past their prime by 1990, but they never got better than this, despite some very fond memories of ‘Love Comes Quickly’ – but that’s another story. Primal Scream’s ‘Loaded’ featured on their breathtaking 1991 album Screamadelica. It was hard to pass over ‘Come Together’, but I have done it because ‘Loaded’ really exemplifies the band’s departure from indie rock. They had begun a journey towards a style of alternative rock that drew heavily from the pervading dance culture. The drum loops and house beats were evidence of the time, but listening to it now, I hear the welcome influences of dub. Have a great week. Before Britpop killed of the excesses of shoegazing, Lush were at the vanguard of the introspective genre. Off the 1990 Mad Love E.P., ‘De-Luxe’ showed off the Lush sound of cascading guitars and Miki Berenyi’s blended vocals. The band broke up not long after the suicide of their drummer, Chris Acland (pictured behind the red bonce of Berenyi) in 1996. OMG, it’s ‘Last Rhythm’. The Silvie Carter vocal version of this track defined a clubbing era. But it was one of the electronic punctuations at 4mins 17secs that would become the pre-Ibiza sound of hedonism. Have a great weekend.